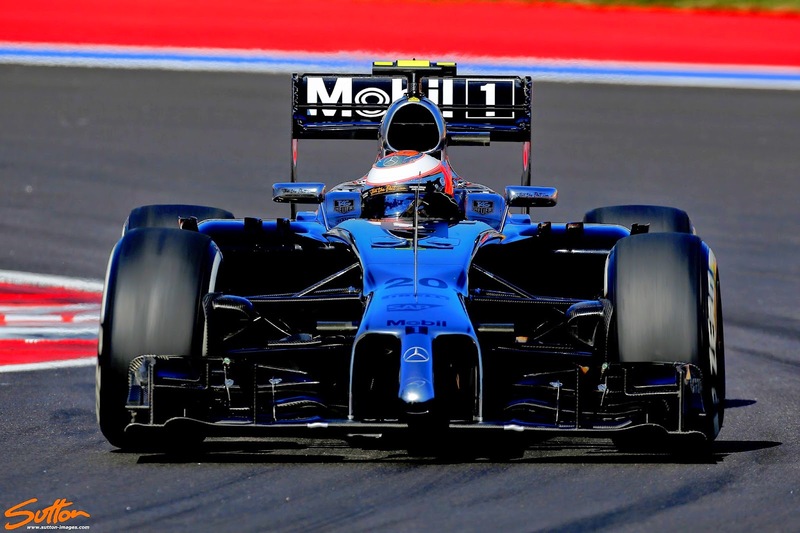 Updates are particularly thin on the ground in Sochi this weekend, owing to strict customs. Most teams have openly admitted that they needed to have parts with them in Suzuka for them to make it across to Russia, meaning they may aswell have run them in Suzuka too. A new front wing has materialized at McLaren (lower wing in the image above) though which outwardly appears very similar to their old design, infact the largest change comes to the mainplanes connection point at Y250 (250mm from the front wings centreline, with the mandated neutral section occupying that area). The 500mm neutral section of wing has been a playground for teams since its introduction as although it's design is the same for each team, how it interacts with other areas can improve performance. In previous seasons the teams have also used the camera housings to influence the flow over the neutral section but for 2014 this was eradicated by the introduction of their mandated positioning further upstream on the side of the nosecone. 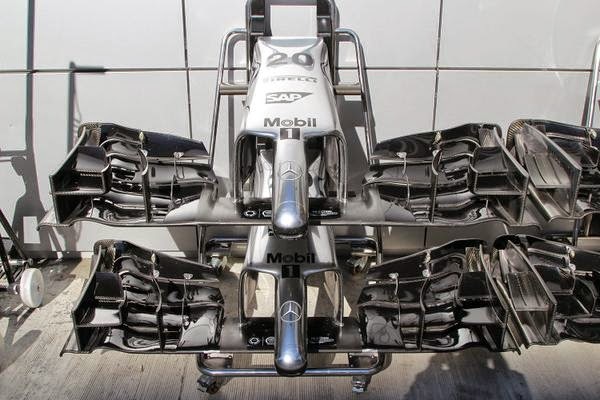 You'll note that in the case of McLaren's new wing two metal inserts sit either side of the neutral section and are likely being used as a way of controlling how much flex occurs, as the wing deforms under load. The horseshoe metal inserts are shaped in order to retain how the mainplanes connection with the neutral section creates an elongated vortex. 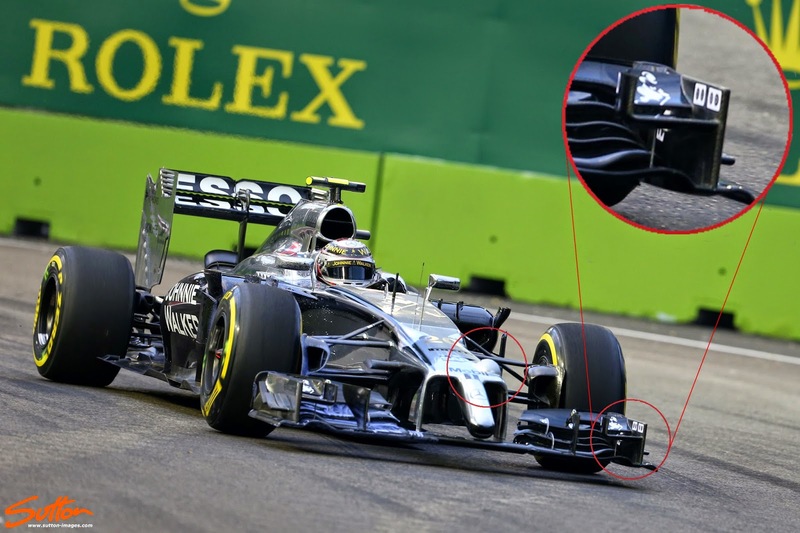 The team were investigating this in Singapore (above) when they installed a camera on the nose of the MP4-29. The camera looks across at dots installed in the front wing endplate and measures the amount of movement, indicating where the team are/were losing/gaining performance. Outbound of the Y250 connection we can also see that the mainplane and how it splits to form the two part flap is also more convex, adjusting how that section of the wing performs with less deformation. It seems that the team are trying to retain a more stable Y250 vortex assisting the central rearward flow, rather than taking advantage from pivoting/flexing outer elements.